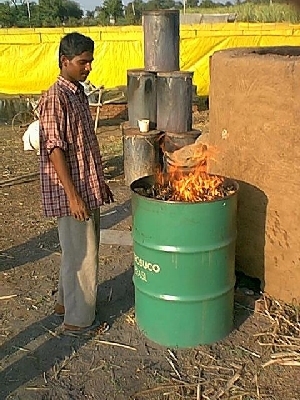 understanding the limitations of gravity with stoves. One shows a wedge shaped door spacer "the Artful Dodger' which picks the stove's pocket for draft and connect it to any burner idea I can cobble together. pellets. So far there has been no fumes coming up and out, and the fire has not chased the air and fuel back into the hopper. The bottom throat on the hopper is about 5 cm diameter. It operates continuously at one speed with an input of 1.6 kg of wood pellet per hour. This is a very short video which demonstrates the flame holding ability of a hole-in-thin-plate as Andrew described. The video also shows the nature of flame speed. For most of the video the flame is loosely attached to the outside of the combustion chamber. 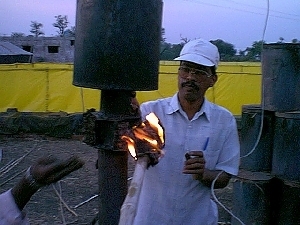 During this time the mix is fuel rich and has a slow flame speed slower than the rate at which it leaves the chamber. Near the end, the flame is able to rush back inside. I can control this with primary air or secondary air adjustments. Primary air controlling the rate of fuel gas production, secondary air supply providing oxygen for combustion and both influencing the resulting mix and its flame speed. The following three images relate to single experiment. 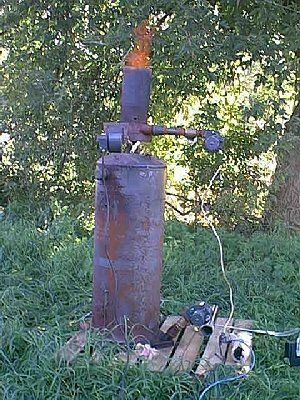 The goal was to set up a forced air burner for the gasses from a top-down pyrolyser. 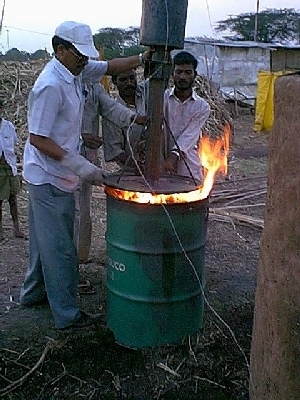 This is a concept which could be scaled up for firing a conventional boiler, kiln or __________(you fill in the blank). 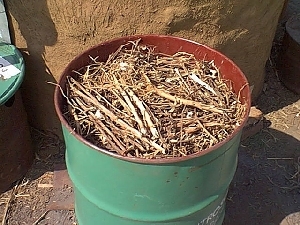 Clean combustion of pyrolisis gasses while making charcoal with wood pellets.